Looking for an all-around mouthwash that freshens breath, eliminates plaque, and whitens teeth? Look no further than Oxyfresh Mouthwash with Patented Zinc. Oxyfresh Mouthwash is a powerful oral rinse that contains no alcohol, which means there is no burning sensation and no drying of gums. Its most potent ingredient is Oxygene, a safe, non-toxic ingredient that eliminates odor-causing molecules. Its formula neutralizes bad breath on a molecular level. Oxyfresh directly targets its source, sulfur-producing bacteria, to combat morning breath and post-meal bad breath. The professional-grade rinse lasts all day and stops plaque from forming, with three powerful ingredients - zinc, Xylitol, and Oxygene - which guarantee you'll never have to worry about your breath or your smile, giving you full confidence every day. This Oxyfresh oral solution is perfect for cosmetic support, long-term supportive periodontal maintenance, and soaking appliances, splints, and removable prosthetics such as partials and dentures. It is naturally flavored by peppermint oil, which soothes and cools with a pleasant taste. It's dye-free formula is non-staining to protect your teeth. It is also sugar-free and fluoride-free, preventing damage to your pearly whites. Recommended by dentists and customers alike, this fast-acting and proven formula is suitable for everyone. Use Oxyfresh Mouthwash with Patented Zinc for all your daily mouth-rinsing needs. ★ STOP BAD BREATH - Oxyfresh Mouthwash with Patented Zinc (16oz) offers a fast-acting, one-minute rinsing solution for fresh breath that lasts all day! A patented mixture of Oxygene and zinc completely fights odor-causing bacteria right at the source. Neutralizing the sulfur-producing bacteria in your mouth, you no longer need to worry about bad breath. ★ RECOMMENDED BY DENTISTS - For more than 30 years, Oxyfresh products have been highly recommended by dentists and oral specialists thanks to their pharmacologically safe ingredients that are highly effective in keeping the mouth free from odor-causing germs. With this product, you're guaranteed lasting fresh breath confidence without any burning sensation. 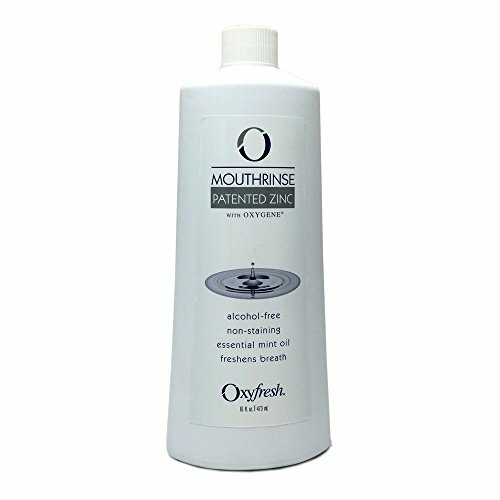 ★ CLINICALLY PROVEN - Gain peace of mind with Oxyfresh Mouthwash with Patented Zinc. Backed by an independent 12-month clinical study published in the International Journal of Biomedical and Advance Research, Oxyfresh is better than the leading brands! Research has shown that Oxyfresh has better long-term results when it comes to reducing plaque, strengthening gum tissues, and improving receding gums. ★ NON-TOXIC INGREDIENTS - This mouthwash is uniquely formulated with essential oils and peppermint for a fresh sensation. It is alcohol free so you get all the benefits with none of the burn! This product has xylitol, a natural plaque-fighting sweetener. ★ NO ALCOHOL - The mouthwash offers safe and effective oral care without alcohol, which is a formula that we pioneered!